The decaying state of a few West End “treasures” irks me somewhat, with a number of shows looking tired compared to the fresh meat of theatrical productions. I am sad to now add Mamma Mia! to my list of the aged. The main problem with the show is that it is stuck in a time warp from the late 90’s – nothing appears to have changed at all. Choreography was by the book, Sophie’s pathetic far off gaze was robotic and the crudely painted set (most offensive was the rather sad and sparse “shrubbery”) could have been the same used on opening night some 15 years ago. Theatre has moved on, and so has audience expectation. If I am to spend £90+ on a ticket to a show I expect to see my money on stage. Here it is nowhere to be seen. Quite frankly this production is laughable when compared to modern offerings such as The Curious Incident of the Dog in the Night Time, which is a truly cutting edge experience. Every part of this show is tired. With the exception of Claire Poyzer, who played a stand out Donna, the cast members simply looked like they were going through the motions, like an over oiled (sometimes literally in the case of the stag do “hunks”) machine. Moreover, I suspect that Poyzer was such a delight as she is the alternate Donna and therefore doesn’t have to perform the show 8 times a week. This leads me to question, with a large talent pool of performers looking for work, whether performers should fulfill 8 show contracts? If the result of them doing so is the kind of mindless movement on display in Mamma Mia! then I would say no! Worse than merely existing in a strange 90’s time warp, the show has actually sacrificed some of its original stand out features. For example it has been majorly scaled back since its Prince Edward and Prince of Wales theatre glory days, so much so that I often heard pre-recorded click track boosting the vocals on stage. This is NOT okay with me. Sing it live, or don’t bother. For all intent and purpose of the ABBA loving audience, they may as well have just played the CD. Urgh. In my opinion, Mamma Mia! needs to up its game if it wants to retain its place as a contender for high quality entertainment on the West End. Writers and directors need to learn how to adapt if they want to keep a good show relevant. Perhaps all Mamma Mia! needs is some script and choreography adaptations, a motivated cast, a bonfire to burn the click tracks and a new set designer to dispense with the wooden bushes. Not too much to ask? Right? 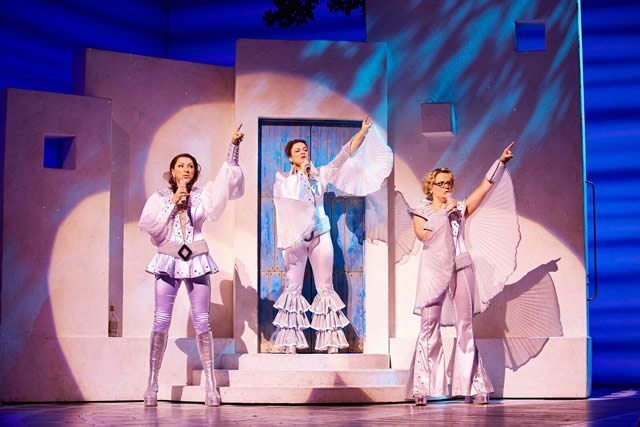 Every dancing queen has her day but sadly for Mamma Mia! I think the party is drawing to a close.